I grew up in a family that loved to cook. On Saturdays, my sister and I would go shopping with our Mum and then we would spend the afternoon cooking and preparing meals for the week. We would all help make the meals together of an evening. Sometimes we had different interpretations, so that could be a bit tricky (e.g. the Thai phase mum went through when she even went as far as to change a ratatouille/bolognaise sauce I had created into a spicy version with coconut milk and sweet chilli sauce). My sister is an amazing cook. When I told her I planned to do a $5 Friday series of meals, she offered to provide me with some recipes as well. And so she shared her favourite simple, cheat and nutritious lemon pasta. It is simple but soooo nice. Try it and you will see why. She makes this with big, bulging lemons from a tree growing on her property in the Gold Coast Hinterland. “I started making this very simple and easy dish when I was pregnant and had gestational diabetes. I would always get really good readings after having this for dinner. Now my four year old loves it as much as I do! And it costs less than $5 for a family of four. Cook the linguine according to the packet instructions. Meanwhile, gently toast the pinenuts in a dry cast iron frypan until they are just browned. 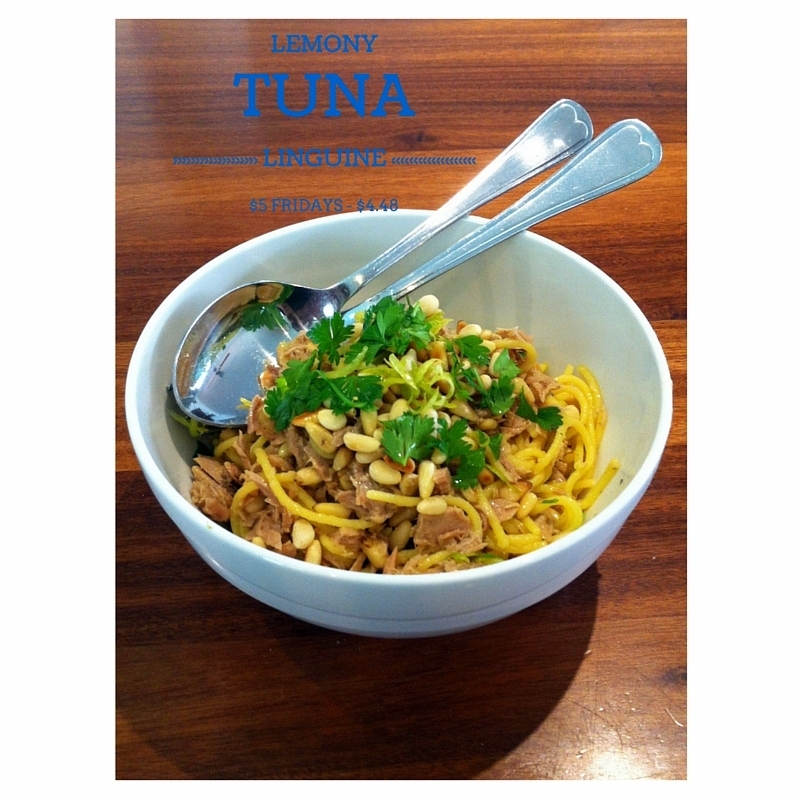 When the spaghetti is cooked, drain and stir in tinned tuna & lemon juice. Divide into four plates and garnish with the pinenuts and lemon zest. Season with lemon pepper if desired.